The Diet and Health Connection. 1st Post Due by Day 3. We often hear about the importance of eating healthy and maintaining a healthy lifestyle; however, many Americans struggle to accomplish this goal. Countless Individuals around the world still fail to realize the significance of healthy eating and the subsequent benefits to our health and overall well-being. • Analyze the connection between diet and health. • Select two nutrients, which can positively affect our health and wellbeing. Why are these nutrients crucial to our health? • Explain two consequences on our health, resulting from inadequate or improper nutrition. In your response, be sure to include information on malnutrition and chronic disease. Your initial contribution should be 250 to 300 words in length. Your research and claims must be supported by your course text and a minimum of one additional scholarly source. Use proper APA formatting for in-text citations and references as outlined in the Ashford Writing Center. • Examine the cultural and social connections attached to food. Provide one examples of a personal and/or environmental factor driving your food choices based on your culture or upbringing. • Explain at least three physical, psychological, social, and /or philosophical factors that lead to our food choices, and discuss how these factors are relevant to your own life. Nutritional Recommendations. Review the 2010 Dietary Guidelines for Americans on page 38 of your text and address the components below. • According to Table 2-1 in Chapter 2 of the text, evaluate the key recommendations of these guidelines and state how these recommendations compare to the realities of the U.S. diet. • Based on these guidelines and your current dietary strengths and weaknesses, design a personalized plan entailing which food groups or food products you need to consume more of. Which food groups or food products need to be limited or avoided? • Review the Checking out Food Labels section on pages 49-57 of your textbook. Analyze the components of a food label, including the nutrition facts panel and the ingredient list. Based upon what you have read, as well as your own personal knowledge, how helpful do you think this information is in encouraging Americans to make healthier choices? Do you read food labels? If so, how is that practice beneficial to your personal diet plan? • Analyze the roles of carbohydrates and fiber and their importance to our health. • Discuss why avoiding dietary carbs might be ill-advised. • Evaluate current recommendations for carbohydrate and fiber intake. • Assess two sources of carbohydrate-rich foods, as well as two sources of fiber-rich foods. Guided Response: Respond to a minimum of two of your peers in at least 100 words each. Assume your peers do not meet the current recommendations for carbohydrate and fiber intake. Please offer different solutions to each peer on how he/she can add more fiber and carbohydrates to their daily diet. Overweight, Underweight, and Obesity. On a daily basis, we can witness individuals with too little or too much body weight. While the latter has become a more common occurrence over the past years, both scenarios cause concerns for our health – short-term and long-term. 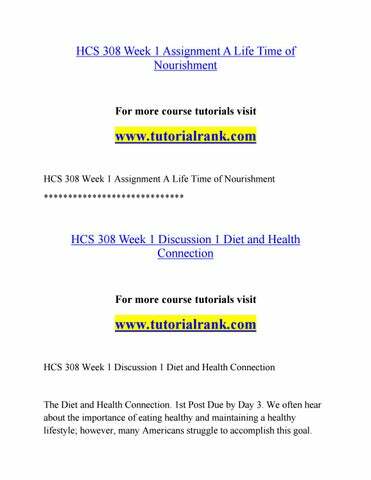 • Chapter 9 of your course text defines the following terms: underweight, overweight, and obese. Explain the implications of each of these conditions on our health. What are the health risks of having too little body fat, and conversely, what are the risks of having too much body weight? • Using Figure 9-3 from Chapter 9 of the course text as a reference, explain how mortality is impacted by underweight and overweight status. What preventive measures can we take to prevent underweight and overweight issues in our society and maintain a healthy body weight? • Report two actions or programs, that your community or state has implemented to address underweight, overweight, and/or obesity. • Explain the connection between nutrition and each of the following health conditions: cardiovascular disease, hypertension, and cancer. • Analyze the function of certain nutrients and their role of either minimizing or increasing the risks for each of these conditions. • Physical activity and nutrition go hand-in-hand with regard to maintaining a healthy lifestyle. Analyze the importance of healthy eating and vitamins and minerals in supporting physical endurance and athleticism. What are the benefits of regular, long term physical fitness on our health and well-being? • “Being fat can hold you back.” This is a comment from one of the children interviewed from the video: The Weight of the Nation: Part 3Children in Crisis. After viewing this video, explain three side effects from being obese as a child and three health consequences obese children are at risk for? Life Cycle Nutrition- Given the significance of nutrition at each stage of the life cycle, evaluate the nutrition recommendations and dietary guidelines for each of the following developmental stages: pregnancy, infancy, childhood, adolescence, and adulthood. Examine three ways of how we can develop healthy nutritional habits from the onset and carry these habits with us throughout the life cycle? What are the consequences of not doing so? formatting for in-text citations and references as outlined in the Ashford Writing Center. Guided Response: Review several of your classmatesâ&#x20AC;&#x2122; posts and respond to at least two of your peers. Each peer response should contain 100 words at a minimum. First, reflect on your own research and the findings shared by your peers. Then, select one stage of the life cycle and create one convincing statement on why this is the most crucial stage in your opinion. • Based on the information from Figure 15-2 in Chapter 15 of the course text, assess the Poverty-Obesity paradox and explain how poverty can lead to both food insecurity and obesity. What are the root causes of this paradox? • “Where you live matters, and it matters a lot.” This is a statement from the video The Weight of a Nation: Poverty and Obesity, part 4. Analyze two potential solutions which could ensure a healthier diet among those living on a lower income. • Examine potential cultural differences relating to food choices.